"Southern Comfort" is one of the latest homes being built by Holiday Beach Rentals Development. 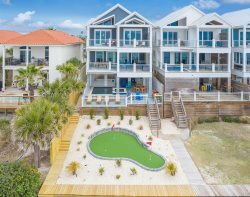 It sits directly on the East End of Panama City Beach and is located around popular attractions, good eats, and nightlife. This new, luxury home features a private heated* pool, a beach walkover, an open concept master suite, outdoor lounge space, foosball table, and everything else you can think of to make your beach getaway beyond comparable. The first floor of Southern Comfort features two King bedrooms with connected bathrooms and a street view. Down the hall you'll find a spacious washer/dryer room, a half bath, and a seating nook. The open floor plan is perfect for gathering the group in the kitchen, living, and dining area. The living room is equipped with a flat screen TV and leads straight out to the outside pool deck and lounge area, where you can see the mesmerizing Gulf of Mexico. Head up to the second floor and there is a Queen over Queen bunk bedroom with a connected bathroom. There is also a King bedroom on the south side of the home which shares the hall bathroom. There is a King Master bedroom that has an ocean view and direct balcony access. Also on this floor is a second set of a washer/dryer and a common area with foosball table and 60" flat screen TV. Head up to the third floor where there is a large loft common area with a Twin over Queen bunk bed nook as well. The bunk room on the south end of the home features 2 Twin over Twin bunk beds with an additional 2 twin beds on the side, sleeping 6 guests. The third floor master suite is surely breathtaking. It has an open floor concept with a claw tub and luxury stained glass in the bathroom area. You can enjoy the view of Panama City Beach from the glass balcony just off the bedroom. Southern Comfort sits side by side with Sea Turtle, Coastal Luxury and High Tide. Perfect for large groups.